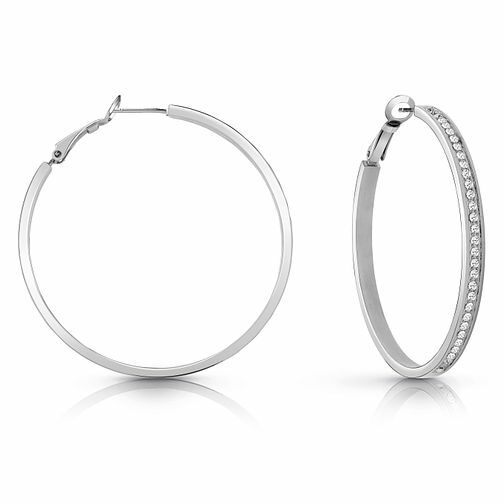 These Guess rhodium-plated hoops have a simple and elegant silhouette with a refined white Swarovski® pavè setting on the front section, the perfect finishing touch to your outfit, day or night. Guess Rhodium Plated 50mm Crystal Hoop Earrings is rated 5.0 out of 5 by 2. Rated 5 out of 5 by Anonymous from Amazing quality Beautiful earrings and so glad they were back in stock as I wanted to get my mum them for Christmas but was out of stock but finally managed to get them. So pleased with them and how they look. Absolutely stunning. Mum was also happy about them too which was great. Rated 5 out of 5 by Anonymous from Perfect size Nice size with a nice dazzle in the right light. Perfect earrings for my 16 year old.